Iceland is the ultimate winter holiday; imagine volcanic landscapes, thermal lagoons, geysers erupting and of course, the spectacular Northern Lights. It’s home to some of the clearest and brightest of skies too – so although chilly, the days will be fresh, making the scenery even more incredible. Very much a travel hotspot, we can absolutely understand why – the destination offers something completely different to the norm! So, if you’re in the search of a unique getaway, Iceland could be the destination for you – take a look below for what’s not to be missed and our top recommendations for your break here. No visit to Iceland would be complete without exploring the world’s most northerly capital city. The perfect base for any Iceland trip, most day tours operate from Reykjavik, taking you out to rural parts of the island. But don’t be fooled – Iceland’s capital also offers incredible sights, a friendly culture and a cosmopolitan charm, so be sure to make time to explore it. The city’s full of colour, as each and every corrugated iron house is painted a different colour to the next – take a moment to soak up the views around you before getting a few snaps. The night life won’t disappoint either – whether you’re a total foodie, want to experience the lively bars or enjoy a bit of both, Reykjavik has an abundance of world-class independent restaurants and quirky bars to party on down in with the friendly locals. Iceland’s not short of a natural wonder or two. Hot springs, mountains, glaciers, volcanoes, geysers, lava fields… you name it, Iceland’s got it. When we say it’s not something you see every day, we really mean it – the sights are so very picturesque, it’s no wonder it’s a destination fast becoming one of Europe’s most popular short break destinations. In fact, Iceland is one of the most geologically active places in the world – and being so close to it here in the UK, there’s no excuse not to pay it a visit! Visit in the winter months, (in particular between December and March) and the odds will be in your favour for seeing the sight everyone dreams of, the Northern Lights. Book on a tour and you’ll be taken out of the very best chance of seeing them. It’ll be a late, but so worth it. It’ll be one of the most amazing, natural sights you’ll see in your lifetime, trust us! Seljalandsfoss in Iceland’s south is one of the very best waterfalls you’ll find here. Pay it a visit and you’ll have the chance to walk behind the falls on a track the circles the pool below, pretty cool eh? Around the corner is the 60metre high Skogagoss, a waterfall well known for its double rainbows – the most photographed waterfall in the country – so don’t miss it! If you can hang around until sunset, (we recommend you do), the photos will be at their very best. And oh my, the blue lagoons. You can’t get more zen than bathing in a hot spring surrounded by snow… in the middle of nowhere! There are five to try in Iceland, all as worthy as the next – so make sure you try one when you visit! The adorable puffins are only a short hop away from Reykjavik’s Old Harbour, so there’s every opportunity to spot them – and there’s plenty of them too. In fact, Iceland is home to over 60% of the world’s Atlantic puffin population! If you’re lucky, you may even find the cute little creatures hopping along the streets of Reykjavik. If visiting Iceland in the summer’s for you, you’ll have more chance of coming face to face with the puffins, as they come to life from May to August. There’s plenty of opportunities to go whale watching too – there are more than 20 different species of cetacean that swim their waters, in particular on the west and northerly side of the island. The gentle mammals can be seen all year around, but for a higher chance to getting up close to them, visiting in the summer will be your best bet. A destination for all seasons, Iceland’s got scenery, culture and nature that will amaze like nowhere else in the world – and what’s even better, it’s on our doorstep. 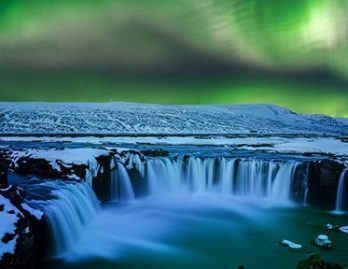 Superbreak offer a series of three and four night tours to northern Iceland with their ‘Incredible Iceland’ range. They take you to areas of the country that you would otherwise never visit, we’re certain it’ll astound you! To find out more about Iceland, call us today or pop into store for a chat.